Graphene is a two-dimensional nanocarbon material, having unique electronic, optical and thermal properties that can be applied for optoelectronic devices. 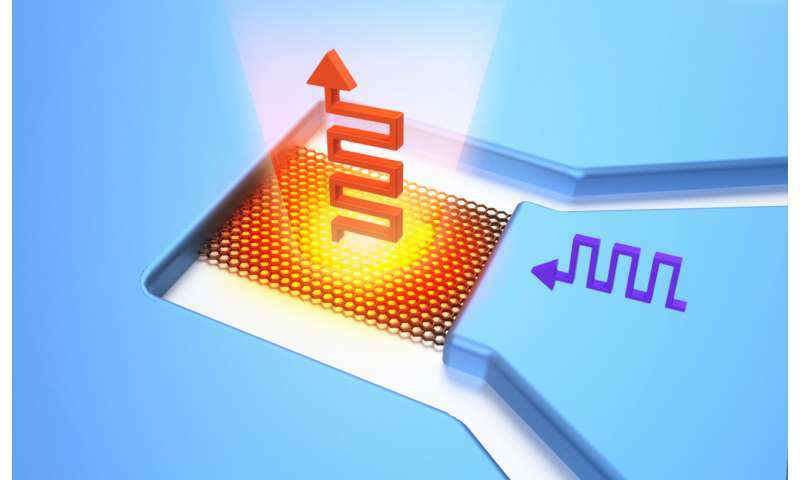 Graphene-based blackbody emitters are also promising light emitters on silicon chip in NIR and mid-infrared region. However, although graphene-based blackbody emitters have been demonstrated under steady-state conditions or relatively slow modulation (100 kHz), the transient properties of these emitters under high-speed modulation have not been reported to date. Also, optical communications with graphene-based emitters have never been demonstrated. Here, the researchers demonstrated a highly integrated, high-speed and on-chip blackbody emitter based on graphene in NIR region including telecommunication wavelength. A fast response time of ~ 100 picoseconds has been experimentally demonstrated for single and few-layer graphene. The emission responses can be controlled by the graphene contact with the substrate depending on the number of graphene layers. The mechanisms of the high-speed emission are elucidated by performing theoretical calculations of the heat conduction equations considering the thermal model of emitters including graphene and a substrate. The simulated results indicate that the fast response properties can be understood not only by the classical thermal transport of in-plane heat conduction in graphene and heat dissipation to the substrate but also by the remote quantum thermal transport via the surface polar phonons (SPoPhs) of the substrates. In addition, the first real-time optical communication with graphene-based light emitters was experimentally demonstrated, indicating that graphene emitters are novel light sources for optical communication. Furthermore, we fabricated integrated two-dimensional array emitters with large-scale graphene grown by chemical vapour deposition (CVD) method and capped emitters operable in air, and carried out the direct coupling of optical fibers to the emitters owing to their small footprint and planar device structure.